No, it wasn’t invented by greeting-card companies. Mandy Len Catron is the author of "How to Fall in Love with Anyone: A Memoir in Essays." It was Liz Lemon, the protagonist of “30 Rock,” who noted that the word “lovers” really tends to bum people out — “unless it’s between the words ‘meat’ and ‘pizza.’ ” But it’s February and lovers are everywhere, celebrating the holiday we love to hate. Valentine’s Day occupies a strange space in American culture. The occasion is defined by its strong traditions, but few of us know anything about where they came from. When it comes to this celebration of love, misinformation abounds. Valentine's Day was invented by greeting card companies. The truth is much less romantic. According to Lisa Bitel, a historian of Christianity, “our modern holiday is a beautiful fiction.” Bitel points out that there were several 3rd-century saints named Valentine, at least one of whom was decapitated on Feb. 14. Most likely, the feast of Saint Valentine commemorates the martyrdom of two men, but while we have some idea of when and how they died, historians know almost nothing about their lives. The Oxford Dictionary of Saints pulls no punches on the subject: “The connection of lovers with St. Valentine, with all its consequences for the printing and retailing industries, is one of the less likely results of the cult of the Roman martyrs.” Most likely, the romantic stories were invented centuries after the martyrs’ gruesome deaths. a celebration of love . The links to Lupercalia, though, don’t hold up well to investigation. Geoffrey Chaucer appears to have been the first person to imbue St. Valentine’s feast day with romantic associations back in the 14th century. In his poem “Parlement of Foules,” Chaucer imagines Valentine’s Day as the occasion for birds to convene and choose their mates. Literary historian Jack B. Oruch points out that the holiday had no romantic pretenses “either literary or social in customs, before Chaucer.” Given the thousand-year gap between Lupercalia and the imaginary avian assembly, it seems unlikely the two were related. Cupid is the incarnation of sweetness and romance. By the Renaissance, artists began depicting a younger Cupid, often with his mother, Venus, though occasionally still in disturbingly seductive situations, as in “An Allegory With Venus and Cupid” by Bronzino. Baroque and rococo artists embraced the childlike Cupid by combining him with the biblical figure of the cherub. These fat, winged babies were responsible for provoking love rather than participating in it. 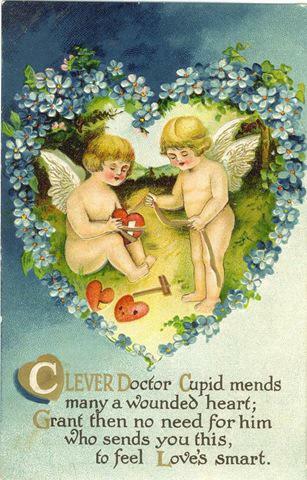 His lascivious past long forgotten, the new Cupid was a beloved character on Victorian Valentine’s Day cards, which is probably how we wound up with such an adorably innocent matchmaker today. Valentine's Day is pretty miserable for single people.